One of the better incarnations of AI comes via a new partnership between Arthritis UK and IBM in which Watson powers a service giving advice to people with arthritis. 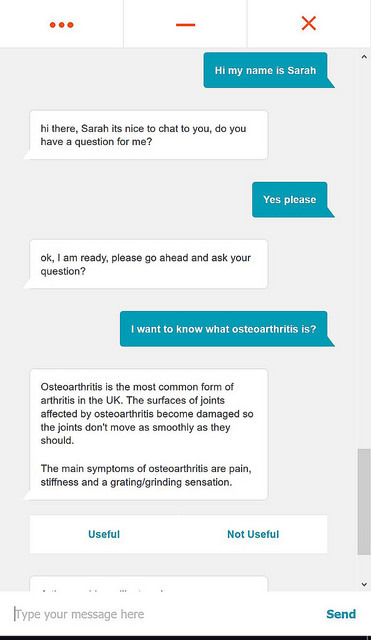 AI-driven chat bots are certainly all the rage at the moment, and whilst I think there is typically more hype than substance to them, one of the better incarnations comes via a recently announced partnership between Arthritis UK and IBM that will see Watson power a new service to give advice to people living with arthritis. The app, which will be available via both app and website, will offer a natural language interface to help deliver personalized support to people anytime and any place. Millions of people suffer from arthritis, and the many different ways it affects people can make finding suitable information online a challenge. Indeed, the existing Arthritis Research UK website receives thousands of queries every day on how to cope with the condition. The charity hopes that by teaming up with Watson’s conversation engine, they can provide people with a quick and easy way to get personalized answers to their queries 24/7. The system was developed with the help of over 350 volunteers who helped to test and improve the tool. It will initially be providing users with general information about arthritis and exercise, but the plan is for the knowledge base to expand and cover a great many more questions over time. Indeed, there are also plans to incorporate voice commands into the service, together with location-based services. Above is an example of the interface.